Research published today in the American Journal of Managed Care demonstrates that analysis of patient records using state-of-the-art data analytics can predict future risk of metabolic syndrome. More than a third of the U.S. population has metabolic syndrome, a condition that can lead to chronic heart disease, stroke and diabetes. These conditions combine to account for almost 20 percent of overall health care costs in the U.S. The study was conducted by Aetna (NYSE: AET) and GNS Healthcare Inc. (GNS), a leading provider of big data analytics products and services in health care. GNS analyzed data from nearly 37,000 members of one of Aetna’s employer customers who had voluntarily participated in screening for metabolic syndrome. A claims-based-only model to predict the probability of each of the five metabolic syndrome factors occurring for each study subject. A second model based on both claims and biometric data to predict whether each study subject is likely to get worse, improve or stay the same for each metabolic syndrome factor. Both analytical models predicted future risk of metabolic syndrome on both a population and an individual level, with ROC/AUC (receiver operating characteristic/area under the curve) varying from 0.80 and 0.88. The researchers were able to develop detailed risk profiles for individual participants, enabling a deep understanding of exactly which combination of the five metabolic syndrome factors each of the study subjects exhibit and are at risk for developing. For every Aetna member whose data was used in the study, the researchers used a scale that measures the percentage risk that individuals have of exhibiting each of the five metabolic syndrome factors. For example, in an individual patient who exhibited two of the five risk factors, researchers could predict which third factor is the most likely to develop. 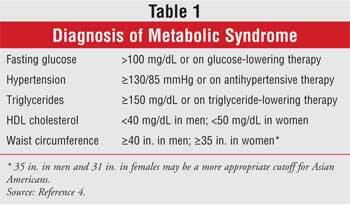 What groups are most likely to have metabolic syndrome? 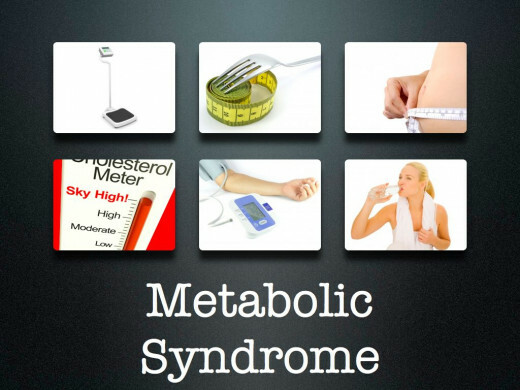 Obesity and insulin resistance are two potential and important causes of metabolic syndrome. Excessive fat in and around the abdomen is most strongly associated with metabolic syndrome. However, the reasons abdominal obesity and metabolic syndrome seem to be linked are complex and not fully understood. Metabolic syndrome is closely associated with a generalized metabolic disorder called insulin resistance, in which the body can’t use insulin efficiently. Some people are genetically predisposed to insulin resistance. People who are not physically active are twice as likely to develop metabolic syndrome and its complications than people who exercise regularly. The analytical models also helped identify individual variable impact on risk associated with adherence to prescribed medications, as well as adherence to routine, scheduled outpatient doctor visits. A scheduled, outpatient visit with a primary care physician lowers the one-year probability of having metabolic syndrome in nearly 90 percent of individuals. In addition, the study found that improving waist circumference and blood glucose yielded the largest benefits on patients’ subsequent risk and medical costs. Aetna is one of the nation’s leading diversified health care benefits companies, serving an estimated 44 million people with information and resources to help them make better informed decisions about their health care. Aetna offers a broad range of traditional, voluntary and consumer-directed health insurance products and related services, including medical, pharmacy, dental, behavioral health, group life and disability plans, and medical management capabilities, Medicaid health care management services, workers’ compensation administrative services and health information technology products and services. Aetna’s customers include employer groups, individuals, college students, part-time and hourly workers, health plans, health care providers, governmental units, government-sponsored plans, labor groups and expatriates. For more information, see http://www.Aetna.com and the 2014 Aetna story about how Aetna is helping to build a healthier world.